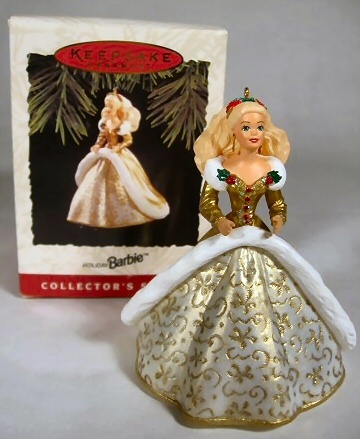 The 1994 Holiday Barbie Hallmark Ornament was the second ornament in Hallmark's Holiday Barbie series. Barbie has long blonde hair and is wearing an elegant gold and white formal gown with white fur trim and a full skirt. The gown has red and green holly accents at the bodice and the same accents are repeated in Barbie's hair. The ornament is the same as the 1994 Holiday Barbie Doll. As with many Barbie collectibles from that era, it was overproduced and is still widely available at less than the original retail price of $14.95.